Lots of fresh veggies for sale at the festival! Feel free to print out our Summer Harvest Festival poster (PDF) to help us get the word out about the festival, and click here for a google map indicating blackberry picking locations at the farm. See you at the festival! 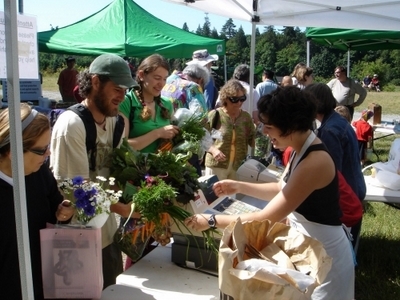 For fresh ideas on how to use that beautiful UBC Farm produce you picked up from our Market, check out the Veggie-of-the-Week blog post series! Crafted by a team of UBC students in the Faculty of Land and Food Systems as part of their Community-Based Research project with Friends of the Farm, these posts contain neat info on folklore, nutrition and recipes corresponding to some of the produce items currently available at the UBC Farm. This week, edible flowers! Gourmet chefs will tell you that taste begins with the eyes, so what better way to visually spice up your food than with flowers that you can eat? Many varieties are edible and each offer their own distinct flavour and appeal. Photo courtesy of OliBac on Flickr CC. 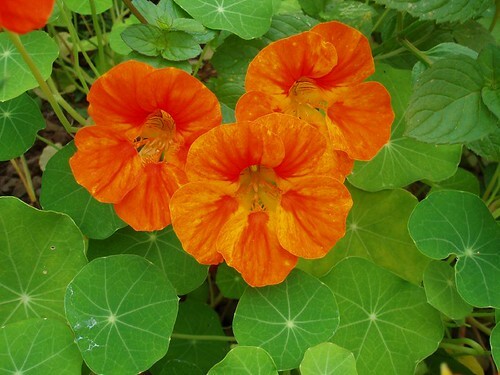 Edible flowers can be incorporated into green salads or used as a garnish for virtually any dish, savoury or sweet. They are especially attractive on pilafs, pasta salads, tarts, cupcakes, mousse, and other desserts. Petals or whole blossoms can be frozen into ice cubes and used in drinks and punch bowls. Select fresh-picked blossoms with no signs of decay. Store in the fridge in a glass of water or an airtight container. It is best to use them within a day or two. Perk up wilted flowers by placing them in ice water for 30 to 60 seconds, and then let dry on a towel. It is important to choose flowers that are grown organically, or expressly for the purpose of consumption, because most of the varieties sold by florists have been sprayed with pesticides and should not be eaten. Extensive pesticide use within the floral industry in general can also be quite harmful to the health of the people who grow the flowers. Fear not, because the UBC Farm grows its flowers using Certified Organic Associations of BC standards or better! UBC Farm Markets offer a confetti-like mixture of bagged edible flower petals, and the varieties included in the mix are described below. Photo by echoforsberg on Flickr CC. 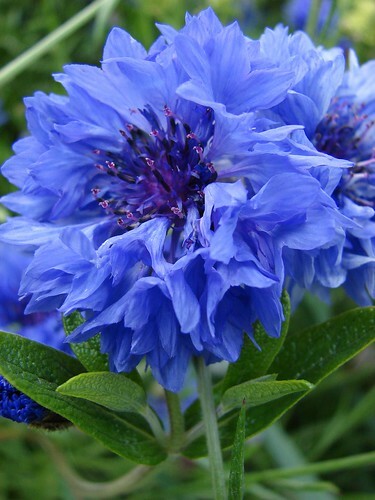 Also known as cornflowers, these bright blue blossoms have a spicy-sweet, almost clove-like taste. Use whole flowers or individual petals on salads and desserts. Photo by amandabhslater on Flickr CC. Buds are often pickled and used like capers. The blossoms come in all hues of yellow, orange, pink and red, and have a sweet, strong, peppery flavour. The leaves can also be used in salads or as an alternative or accompaniment to basil in pesto. Photo by audreyjm529 on Flickr CC. Also known as pot marigolds, these sunny flowers have a tangy flavour and lots of narrow petals that look stunning sprinkled on soup, salads, or ice cream. They look especially gorgeous combined with blue bachelor’s buttons petals. 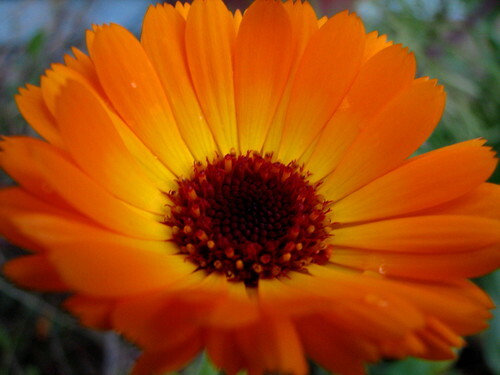 Interestingly, calendula has also demonstrated anti-tumour effects in some in vitro studies. The UBC Farm occasionally grows edible shungiku and borage as well. Shungiku is a white and yellow variety of chrysanthemum. Use only the petals and not the base of the flower. Its leaves are edible when young but can turn bitter once the flowers have opened. 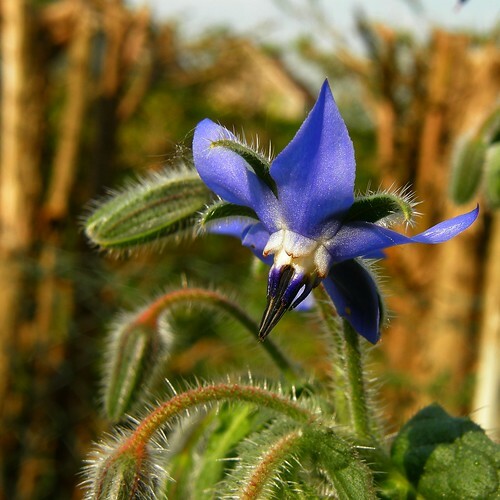 Borage flowers, or starflowers, are blue and have a sweet taste that some compare to cucumbers. Use to garnish dill dips or cucumbers soups. Borage flowers can also be candied by brushing them lightly with beaten egg white, or flax seed egg white for a vegan version, sprinkling with powdered sugar, and allowing them to dry.